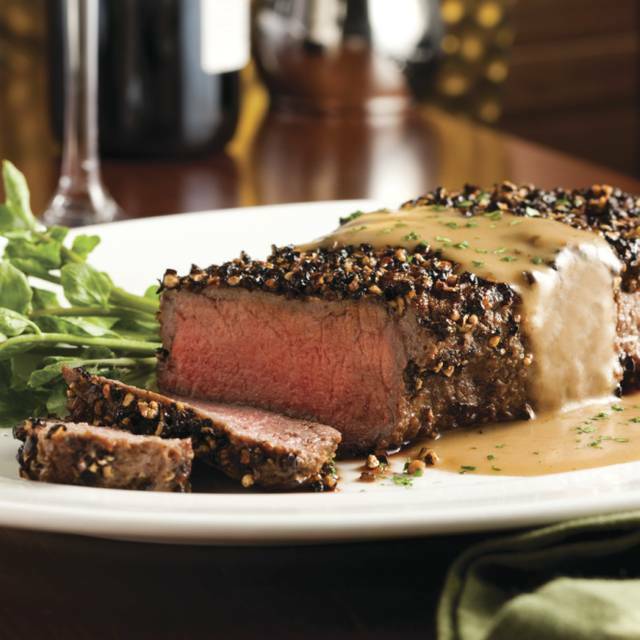 You must make reservations at least 5 minutes in advance of the time at The Capital Grille - Philadelphia. Lunch: Monday – Friday: 11:30am – 3:30pm; Dinner: Sunday: 4:00pm - 9:00pm, Monday – Thursday: 3:30pm – 10:00pm, Friday: 3:30pm – 11:00pm, Saturday: 4:30pm - 11:00pm. 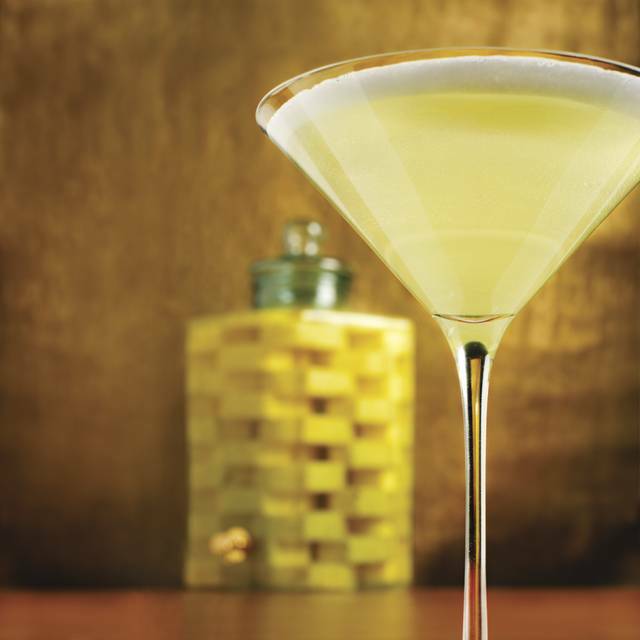 You are cordially invited to be wined, dined, and dazzled at The Capital Grille. 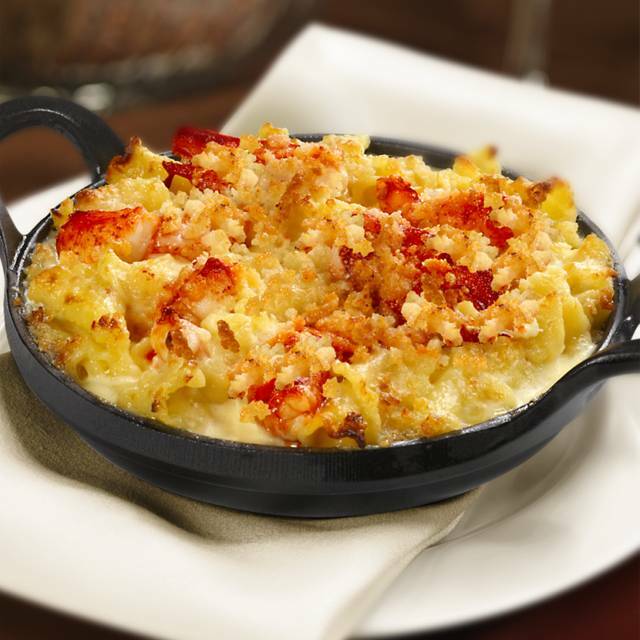 Enjoy nationally renowned steaks — dry aged and hand-cut on premises by the restaurant's own butchers — the freshest of seafood, creative sides, and irresistible desserts prepared on-site every day. All accompanied by an acclaimed wine list, carefully curated by The Capital Grille's Sommelier, featuring more than 350 labels from around the world. Experience gracious, anticipatory service in the comfortable, sophisticated dining room, or host a flawless event in a private dining room appointed with a full complement of state-of-the-art media technology. 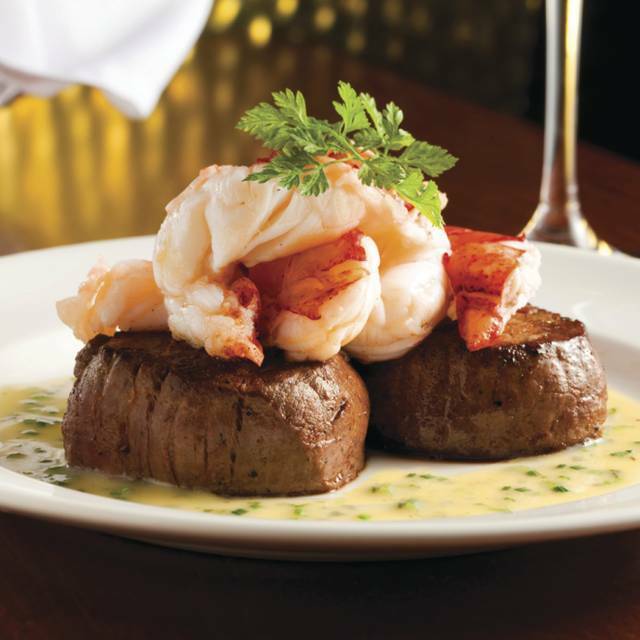 A memorable evening or afternoon of fine dining awaits at The Capital Grille. Located on the Avenue of the Arts at the corner of Broad & Chestnut Streets. Download our mobile app to see today's wine list and pairings curated by our Sommelier, make reservations, view upcoming events and purchase gift cards. Anytime, anywhere. It was our first time here. We had an excellent experience. First we had a few drinks at bar. Bartender was great. Then we sat to eat. Our table was decorated for our Anniversary. What a nice surprise. We got the prosciutto wrapped mozzarella. Best app I’ve ever had. Then came out steaks. Cooked exactly how we ordered they were perfect as were our sides(asparagus and scallop potatoes) we also had some drinks. The vodka/pineapple drink was delicious. We weren’t sure if we would do desert but they surprised us with an anniversary plate with desert on it. Another added bonus. Our waiter ,Jordan, was fantastic. We will definitely be back. We were seated right away. Our waiter, Robbie, and other staff were attentive and professional. We loved the little amuse bouche! The food was perfectly prepared and delicious. All & all, a wonderful experience. Slightly subpar dinner, per my Capital Grille experiences, for table of 4. Steak had very little crust/char, only on one side. Sides were mostly good, could have been warmer. Mushrooms were very poor. I do my entirely blame the chef as they did not seem high quality and were not flavorful, that said there was little to no flavor or seasoning added. Always consistent and why I choose CG whenever booking business lunches when I travel. Wonderful service and meal options. Wine list was outstanding with bottle vs glass options. Steak was delicious., as always at Capital Grille. Would highly recommend reservation. We are devoted Capital Grille patrons - we have a wine locker at our "home" restaurant, but we always visit a Capital Grille when we are traveling. The Philadelphia location is centrally located and lovely inside - the bar is hopping & the niches for more intimate/quiet dining are perfect. We had a great server and the Managing Partner came over to welcome us. Always feels like you are family being welcomed home. And as always, dinner was delicious! It was a great place to make reservations and have emty of time to eat and not rush to a 7:30 show at Verizon Hall. We had crab cakes, lobster bisque, tenderloin steak, lobster tails, and tuna. Outstanding and friendly service. You can't go wrong with the porcini rubbed ribeye, lobster bisque, and the creme brulee. We stopped at the Capital Grille for a bite before heading off to an Amos Lee Concert. We sat at in the bar area and received wonderful service from Virginia. All food and bar items were prepared to perfection and served with great care. We absolutely loved Virginia (VV). Dinner was delicious last night! We LOVE coming to the Capital Grille in Philadelphia! They are so friendly and welcoming there! We came to celebrate my birthday last night before we went to see The Philadelphia Orchestra at the Kimmel Center. Our waiter, Rob, was very friendly and funny! For drinks, I had Coke while my parents had iced teas. For appetizers, Mom and Dad shared a shrimp cocktail, which was okay. Dad then ordered a wedge salad with bleu cheese and smoked bacon. 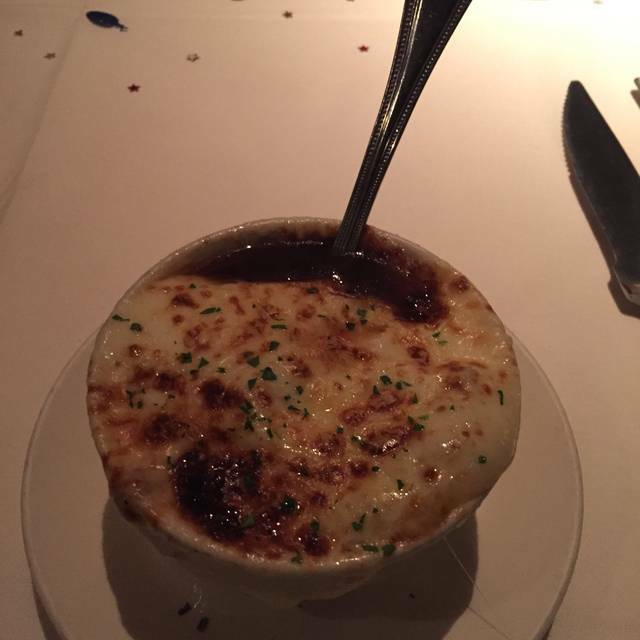 Mom had New England Clam Chowder, which was not her favorite, and I had the Caramelized French Onion Soup, which was DELICIOUS!! For the main course, Mom had the Fresh Maine Lobster, which she LOVED! 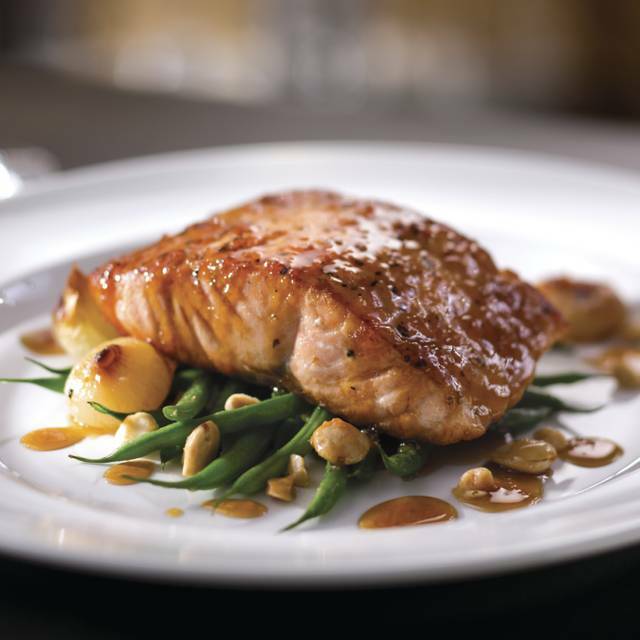 Dad had the Seared Citrus Glazed Salmon with Marcona almonds and brown butter, which was served over haricots verts. I had the 22 oz. Bone-In-Ribeye steak with Sam's Mashed Potatoes and Creamed Spinach, which was yummy! For dessert, Mom had coffee, and I had two little mini deserts of Crème Brûlée Cheesecake and the Flourless Chocolate Expresso Cake, served with cocoa powder and fresh raspberries. I also ordered a slice of the Warm Double Chocolate Cake to go, with port wine infused cherries and whipped cream. Dave, the general manager, came by to say hello and to see how our food was. A must go to for anyone in the City Of Brotherly Love for any special occasion! 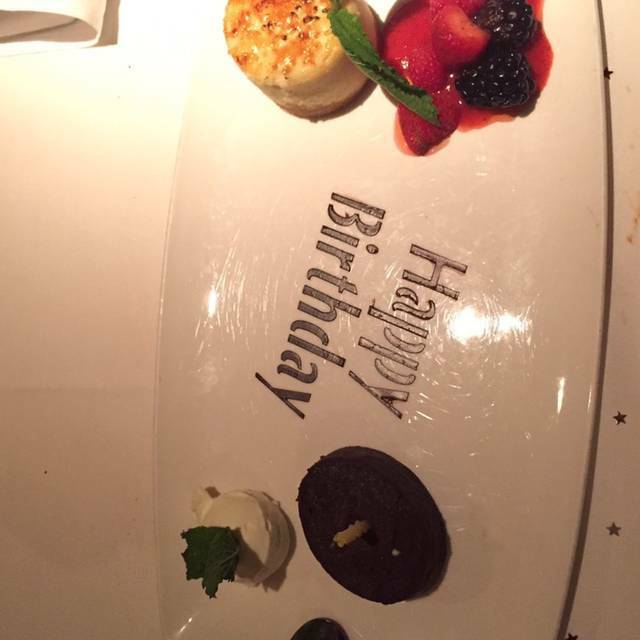 Thanks for making my birthday so special, we look forward to coming back again soon! Classic American with class and good selection of both meat and fish. Very pleasant atmosphere and good service. A classic I would recommend for people like me looking for tradition but also variety. Everything was exceptional, as usual, except I really wanted an English Breakfast hot tea, and the restaurant did not have. They need to have English Breakfast along with their Earl Grey. Thanks. Somehow the Capital Grill messed up just about everything. Our reservation time - they called and asked if we were coming 1.5 hours before our time; they didn't give us menus for about 10min after we were seated; one steak was incredibly undercooked. The staff were nice and friendly though. Overall, excellent as usual. Can never go wrong with their menu and service is always top notch. The steak melted in my mouth. The flavor was incredible. But a little noisy, cramped and pricey. Great service. Excellent attention to allergy issue. Food was delicious. Excellent food and the server was good as well. Love love love! Wow so good! This is is the third and last time I will dine at the Capital Grille. Each time I have been there, the food is very good; not outstanding, but very good. The service has varied from fair to good. My biggest complaint each time I have been there is that I feel as though I am being rushed through my meal. Entrees arrived before we finished our appetizers and we had to help the waiter make room on our table for two to accommodate four large plates- ridiculous! Most recently, as we were having our coffee, a waiter approached our table with a vacuum and proceeded to clean the floor around us while we were trying to finish our meal. Never again. There are too many excellent alternatives in Philadelphia. 2 couples dining together. All ordered filet mignon. 3 were cooked to order and were fantastic. One was overlooked a lot and sent back. Server and manager handled very professionally! Hey... nobody’s perfect. The replacement order came quickly and new side dishes provided. No harm, no foul! Will definitely go again. Everyone enjoyed food and all very satisfied! The place was very crowded and there was a long wait even with a reservation - not sure if this was because of March madness. The staff was great but the food definitely came out a little warm so it was probably sitting for someone to pick up for a while. The ambiance is definitely different than the other Capital Grille’s I’ve gone to. Very old timey and tailored to business men. Still an amazingly seasoned steak. Our server jeoffery was awesome and the food was delicious . Drinks & apps. It was good overall. The Center City location never disappoints! The evening started off slow and we waited past our reservation time to be seated and even longer for our waitress...with that out of the way she was very apologetic and accountable, the manager was also the same way, they covered all of our appetizers and provided a free one without asking..the food was good my only complaint is that it was way to dark several people including us had to use phone flashlights to read the menu. 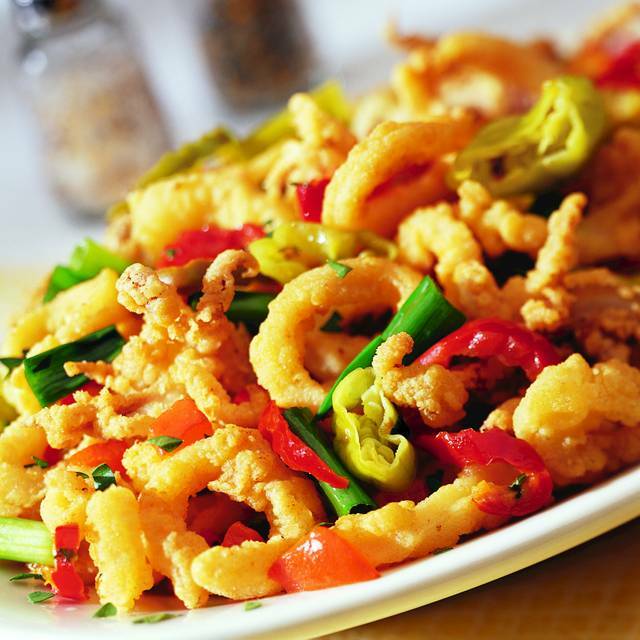 Staff is friendly and very accommodating, food is served hot and very tasty. 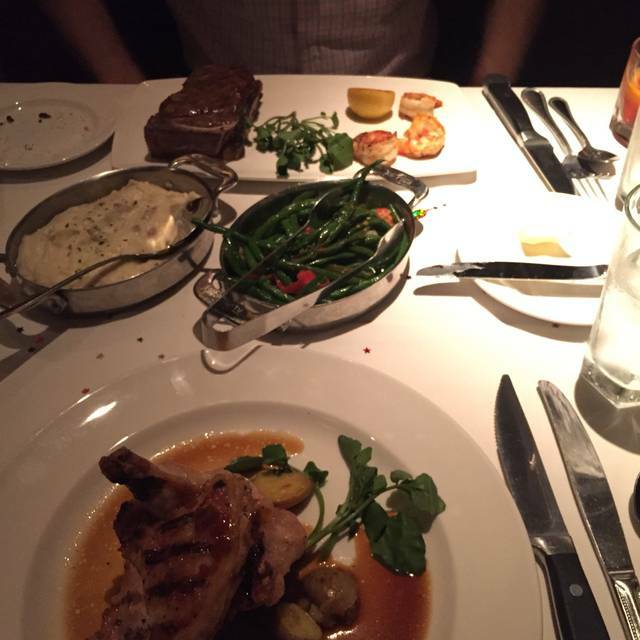 My husband and I both ordered steaks cooked medium which we were told was pink throughout. The meat was well done and only pink near the bone. The staff person offered to replace the steaks but we said it was okay. We received a complimentary dessert at the end of our meal because of our disappointment. We thought this was very good pr. The service was excellent and we would go back. Excellent in every way. Met our expectations and our server Wric was terrific! An outstanding experience! Can’t wait to go back! Great food and great service. Had an enjoyable evening out with my wife. Noise level in restaurant was somewhat high, but it was Saturday night in Philly! Great service, great food! What more could you want? Chris, our waiter, was EXTREMELY attentive. We sat back in a corner of the restaurant which was so nice because it wasn't very noisy and we could all hear/enjoy each other's company. My husband ordered the TOMAHAWK steak - what a great dish! Love how close the Capital Grille is to many great sites in Philadelphia. Definitely going back!